In today’s world, many people pre-book their hotel rooms online for convenience. However, there is still a large percentage who don’t. 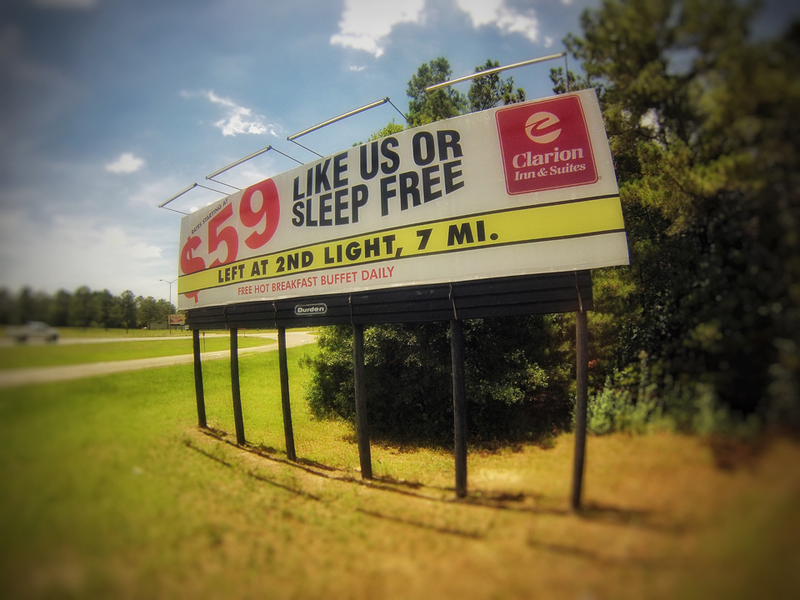 The largest hotel in Dothan, AL decided to use billboards to entice this “last minute” group of travelers. “Most hoteliers just use billboards for directionals. We wanted to put ours to the test” says Hannah Shiver, GM of the Clarion Inn. “We decided to promote our new LIKE US OR STAY FREE promotion & we’ve received a tremendous response. The hotel staff keeps track of customers who mention these billboards and have given them credit for $200,000+ worth of business over the past few years. Durden Outdoor not only helped to increase our bottom line, but made us FAMOUS in the process! !” says Hannah. Click or call us today to see how our team of Famous Makers can help to increase your bottom line. Click here to see other award winning creative. We recently had the opportunity to partner with Julia’s Restaurant to make their delicious buffet FAMOUS in Troy, AL. Julia’s Restaurant wanted to make a huge impact on Hwy 231. They utilized our bulletins to make a statement and tell a story to southbound traffic on Hwy 231. 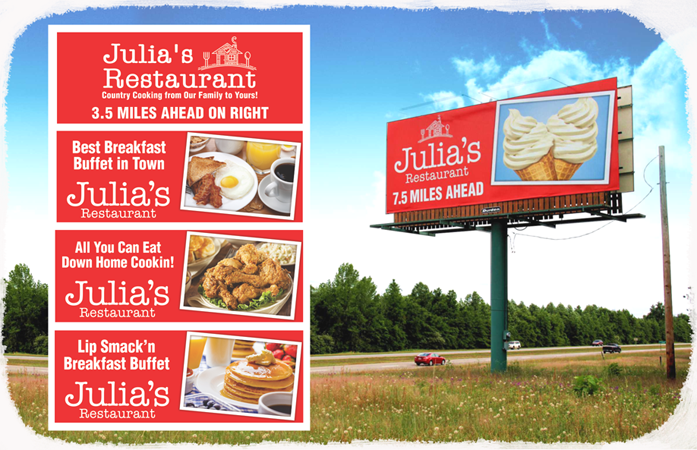 As you travel 231 South to the beach, you will see five different directional bulletins featuring Julia’s breakfast, lunch, and dinner buffet. The weekend after the billboards went up, Julia’s owner Bo Lankford said “we had a record breaking weekend with the highest sales we have ever seen.” Be sure to stop by Julia’s and enjoy their mouth watering down home cooking- they even have a daily menu listed on Facebook https://www.facebook.com/Julias-Restaurant-LLC-171935629493440/ The team at Durden Outdoor can help you reach over one million cars daily. Contact our sales team today about making your business FAMOUS in the Wiregrass. Sporting events and festivals have led to a spike in travel and spending in the Wiregrass area. According to the Alabama Tourism Department’s Economic Impact 2015, travelers spent an estimated $263.7 million in Houston County, $55.3 million in Coffee County, $39.3 million in Dale County, $3.2 million in Geneva County and $3 million in Henry County. The numbers through out the state show more than 25 million people traveled in Alabama last year alone. With the increase in the number of vehicles on the road, comes an increase in the number of views on billboards. 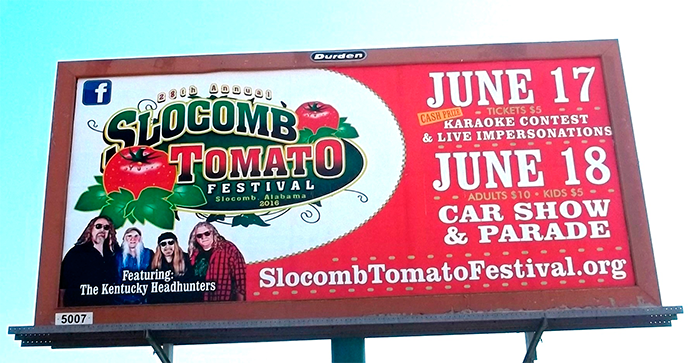 One of our local homegrown events, the Slocomb Tomato Festival, utilizes a mix of digital and rotary billboards to announce their event annually. A clean and consistent message is key. Their billboards can be seen on Hwy 231 South and Hwy 52 West in Dothan targeting locals and beach traffic. They also expanded into the Enterprise market to attract even more Coffee County residents to the festival this year. If you are in the Wiregrass this weekend, be sure to stop by the Slocomb Tomato Festival on Friday and Saturday to check out the karaoke contest, car show, The Kentucky Headhunters, and of course sample one of those juicy Slocomb tomatoes. The team at Durden Outdoor can help you reach over one million cars daily. Contact our sales team today about making your business or event FAMOUS in the Wiregrass.